Only bad writers find constant pleasure in writing; truly great authors have at least occasional fits of creative self-doubt. On the other hand, it is well known that about two out of every thousand people enjoy reading poetry – not counting poets themselves. It is not a majority, but a minority, among the population as a whole, that likes poetry. But poets do belong to that minority. As it turns out, this whole line of reasoning has been an experiment on Moore’s part, calculated to tie together threads of understanding: you find poetry to be a frivolous pursuit, reader? I understand. You make serious demands on it? I understand that perfectly, too. But that means that you are, in fact, interested in poetry, doesn’t it? So here, too, we are agreed. The provocative declaration “I, too, dislike it” displays the classical rhetorical technique of captatio benevolentiae, used in order to show the reader, once won over to the author’s side, her perspective on poetry – to give readers a short lesson in normative poetics, arising in an ostensibly ad hoc manner for greater suggestiveness, right before their eyes, while the connection is still vital. Marianne Moore’s “Poetry” is thus an example of an ars poetica of the moment, which nonetheless does not mean that the estimated temporal horizon of its effect was meant to be limited to that moment. According to Moore, poetry should create imagined worlds in such a way that the effect appears to be truer than reality. It ought to – because it has not yet done that, this is the task poets are faced with (this also offers a partial explanation of why the Complete Poems of such an ambitious poet fills a relatively slim volume, in terms of page numbers). Moore’s tactic for getting the reader to pay close attention to her lecture on poetic art is quite sophisticated: she makes an understanding gesture towards those who do not like poetry without joining the camp of those who have contempt for it. She questions, but does not depreciate. Even if contemporary poetry is “fiddle,” meaning absurdity, nonsense, triviality – its potential is great, we understand if we read between the lines. Ja również nie gustuję w niej; są sprawy ważniejsze poza tym całym rzępoleniem. I, likewise, have no taste for it; there are matters more important beyond all this fiddling. I ja także nie lubię jej. Są rzeczy ważniejsze niż to rzępolenie. I don’t like it either. There are things more important than all that fiddling. Ja też czuję do niej niechęć: istnieją rzeczy ważne a całemu temu bzdurzeniu niedostępne. I, too, feel a distaste for it: important things exist, beyond reach of all this rot. Ja także jej nie znoszę. (I, too, can’t stand it. The first three Polish translations I cited postulate a certain community of those who write and those who read, signaling it by using plural forms. In Rymkiewicz’s and Hartwig’s translations, this formula takes the following shape: reading poetry, with perfect contempt / with the highest disregard, we discover (…); whereas in Prokop’s version, the line reads: when we read poetry with perfect contempt, we can discover (…). Thus the poetic (or, to be precise, translating) persona admits to not only antipathy for poetry (as in the original: “I, too, dislike it”), but also to a contempt for it, shared with the reader. The original, however, is more impersonal in the corresponding place: “Reading it, however, with a perfect contempt for it, one discovers… [. ]” The deeply contemptuous unanimity of author and reader is far from obvious – the constructions with the pronoun “one” can be translated into Polish using the reflexive “odkrywa się” (here functioning as passive, “is discovered”) or even “można odkryć” (literally: “it is possible to discover”). The line is more a hypothesis, rather an attempt to adopt someone else’s point of view than an account of the speaker’s own readerly approach, identical with the impressions of others who nourish a perfect contempt for poetry. This nuance is preserved in Barańczak’s version, where it reads: “A jednak czytając, z kompletną wobec niej [poezji] pogardą, odkrywa / się w niej miejsce, gdzie może zaistnieć prawdziwa / rzecz” (However, reading it, with complete contempt for it, places / are discovered where there can exist a true / thing). Both of the enjambments, “odkrywa / się” and “prawdziwa / rzecz” can be recognized as trademarks of the translator’s style – like the rhyme “odkrywa – prawdziwa” (to which there is no equivalent in the original) in Marjańska’s version. Marjańska, though her translation begins with the strong declaration: “nie znoszę jej” (I … can’t stand it), later writes with greater detachment: “gdy człowiek ją czyta pełen pogardy, odkrywa…” (when a person reads it full of contempt, he discovers…). Thus, not even every reader, but only those who are “full of contempt,” which further narrows the circle of like-minded readers – the absence of a comma changes the meaning enough to give the impression of being a conscious omission. What is more, in this translation poetry “strange… is and true” – it already is those things, as opposed to having the potential to become them, as Moore would have it. Marjańska’s translation is even more affirmative than Julia Hartwig’s version, according to which in poetry “we discover… after all, true places.” These Polish female translators’ belief in poetry is more absolute than that of the poem’s author. Moore’s experiment has one blind spot: will someone who not only does not like poetry, but thinks of it with total disdain, go to the trouble of picking up a book of poems and reading this manifesto of the moment? miejsce na autentyzm, mimo wszystko. mimo wszystko miejsce na coś swoistego. jej własne, wtedy lubimy poezję. do oglądania „zmyślone ogrody z żywymi ropuchami”. chodzi ci właśnie o poezję. This essay combining literary history and translation criticism focuses on “Poetry,” the programmatic poem by outstanding American modernist poet Marianne Moore. 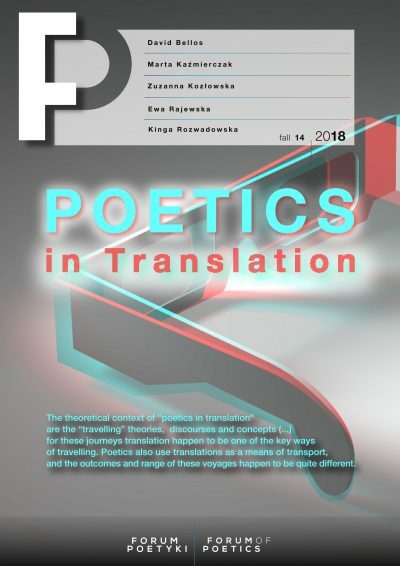 It draws the reader’s attention to the most important interpretative issues in the work, including the poet’s attempt to enunciate the basically “inexpressible” essence of poetry and phenomenon of its functioning. 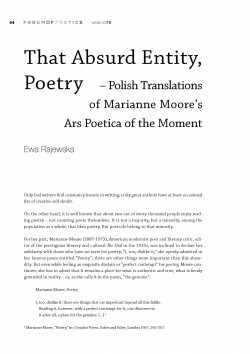 The mystery of poetry and of Moore’s poem are illustrated through a critical analysis of Polish translations by the following translators: Jarosław Mark Rymkiewicz, Jan Prokop, Julia Hartwig, Stanisław Barańczak, and Ludmiła Marjańska, which are provided in an appendix together with the original. Marianne Moore, “Poetry,” in: Complete Poems. Faber and Faber, London 1967, 266-267. Marianne Moore, “Poezja” (Poetry). Trans. Jarosław Marek Rymkiewicz. Tygodnik Powszechny (Universal Weekly)1958, 48, 5. Moore, “Poezja.” Trans. Jan Prokop. Tygodnik Powszechny 1961, 22, 5. Moore, “Poezja.” Trans. Julia Hartwig. In: Marianne Moore, Wiersze wybrane (Selected Poems). Edited and with an introduction by Ludmiła Marjańska. Translated by Julia Hartwig and Ludmiła Marjańska. Państwowy Instytut Wydawniczy, Warszawa 1980, 99. Moore, “Poezja.” Trans. Stanisław Barańczak. Im: Od Chaucera do Larkina. 400 nieśmiertelnych wierszy 125 poetów anglojęzycznych z 8 stuleci. Antologia w wyborze, przekładzie i opracowaniu Stanisława Barańczaka (From Chaucer to Larkin. 400 Immortal Poems by 125 English-Language Poets from 8 Centuries. Anthology Selected, Edited, and Translated by Stanisław Barańczak). Wydawnictwo Znak, Kraków 1993, 457. Ludmiła Marjańska, Słowo wstępne (Introduction). In: Marianne Moore, Wiersze wybrane (Selected Poems), 14. From the version of “Poetry” included in The Complete Poems Moore later deleted a dozen or so lines, including the reference to the absurdity of poetry. The entire poem in its revised version reads: “I, too, dislike it. / Reading it, however, with a perfect contempt for it, one discovers in / it, after all, a place for the genuine.” “Omissions are not accidents,” Moore wrote on the dedication page of her complete works; she included the earlier version in a footnote, however. See Marianne Moore, The Complete Poems, 36, 266-267. Next Post: Jak podchodzić do „poezji jako rodzaju uwagi”?